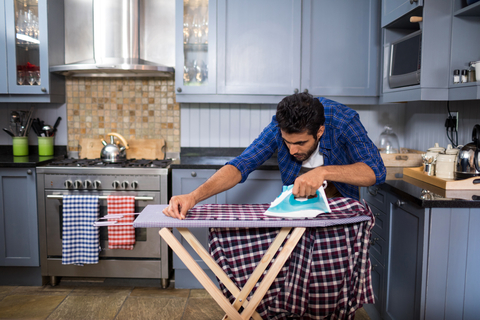 First off let’s get this out of the way: There is no excuse for not ironing, you’ll just look sloppy! A well-pressed dress shirt tells the world that the man wearing it cares about how he looks. That he pays attention to the details. That he understands the importance of first impressions. A man wearing a wrinkled dress shirt implies that he’s trying, but hasn’t quite mastered the game. That some things escape his notice. That he might cut corners. Or maybe that he needs a lesson in ironing. The tools of the trade are a standard ironing board and an iron. When choosing an iron, don’t reach for the cheapest available. Caring for good clothes takes quality tools. A clean iron that gives you the ability to regulate the steam and heat settings will serve you well. Depending on how wrinkly your shirts are, you may want to equip yourself with a spray bottle of clean water or a starch spray to add crispness to the end product. Assess how deep the wrinkles are – if they’re deep and defined, it’s a good idea to mist the shirt with a bit of water. If they’re light, then you can iron it directly. But you want to let that iron get nice and hot so it forms steam when you press it onto your clothes. The best place to start ironing is the collar – because it frames your face it’s one of the first parts people notice. Lay the collar out flat to iron it. Next, unbutton the cuffs and lay them flat for ironing – they are another one of those areas where the eye is drawn, especially when they are longer than your coat sleeves. Afterward, iron each front section separately, taking care to avoid the buttons. No one wants melted buttons dangling from their shirt. Your ironing strokes should be fluid, not choppy, as you smooth out the main sections of the shirt. Take extra care at the top of the shirt, since the tails will likely be tucked in and go unnoticed. Iron the sleeves last – starting at the seams of the shoulders and gradually working down to the cuffs. Make sure to follow any seams and pleats that are built into the shirt – they’re there for a reason. You don’t have to be Iron Man to master your ironing technique, and by following these tips from the experts at SUITS by Curtis Eliot, you’ll always look impeccably put together. If you are looking to make a solid impression with your clothing, we can help. Book an appointment today with one of our tailors to learn more!